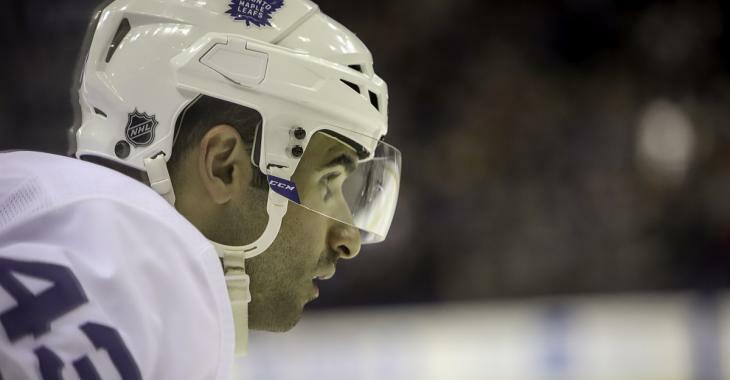 NHL News : Breaking: NHL Player Safety releases full details of Nazem Kadri's hearing. It sounds like the National Hockey League is getting ready to throw the book at Toronto Maple Leafs veteran forward Nazem Kadri. On Saturday night the league announced that it had offered Kadri an in person hearing, a condition that allows the National Hockey League's Department of Player Safety to suspend players for 5 or more games. That alone was a very bad sign for Kadri, a repeat offender, and now with this latest announcement it looks like the league is looking to move quickly on this matter. In an official announcement on Sunday evening, the National Hockey League's Department of Player Safety revealed that Kadri has accepted his in person hearing and will be meeting with the league at their offices in New York on Monday. Although there was no doubt that he would be suspended the fact that this meeting will take place in a different country when the Leafs are expected to play their first home game of the series is confirmation of that fact. The league's decision to move this quickly to an in person hearing suggests to me that they will be looking to suspended Kadri for the remainder of the first round of the 2019 Stanley Cup Playoffs, although that is purely speculation on my part at this time. This will of course only be made all the more frustrating for fans of the Toronto Maple Leafs by the fact that the major antagonist for Kadri in Game 2, Boston Bruins forward Jake DeBrusk, does not appear to be headed for any additional discipline from the league. Breaking: Nikita Kucherov has been suspended by the NHL.